Some days, you just don’t feel like going out and, according to Lorraine, you need chicken soup for edible relief. Well I don’t know about you, but chicken soup is not the kind of thing I ever crave, but chocolate cookies …. well! Preheat the oven to 180’C fan. Cream the butter and sugar together and beat the egg in. Add flours, bicarbonate of soda, baking powder and salt and mix well. Fold in the white chocolate chunks. Make 6-12 balls from the mixture. 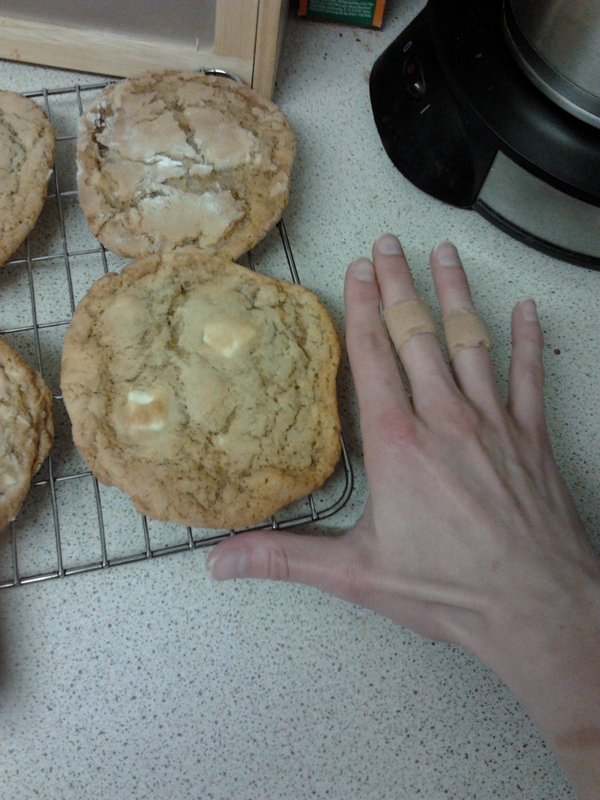 Put them on the baking trays and flatten a bit with your hand. Space them out because they do spread! Bake for 10-12 mins until pale golden. They will still be pretty soft. Cool on the tray for about 5 mins then very carefully move them with a fish slice onto a wire rack. 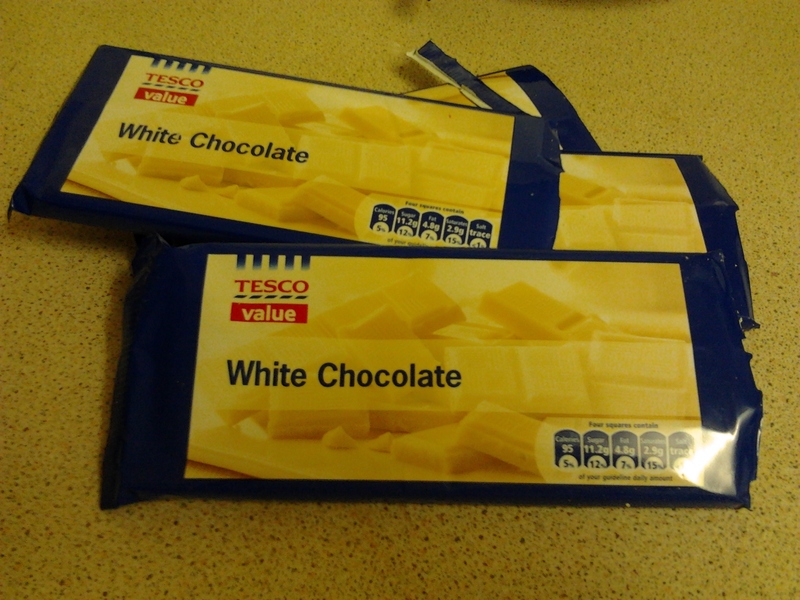 As with most baking recipes, it only calls for storecupboard essentials, plus “good-quality” white chocolate. White chocolate doesn’t contain any cocoa solids – only cocoa butter – so it’s hard to see how the quality matters that much. Perhaps good quality white chocolate contains milk from the finest pampered Devonshire cows, milked by specially trained cats. I decided to risk it and go with something cheaper. (if you zoom in, you’ll see the plasters over my horrific trolley injury). 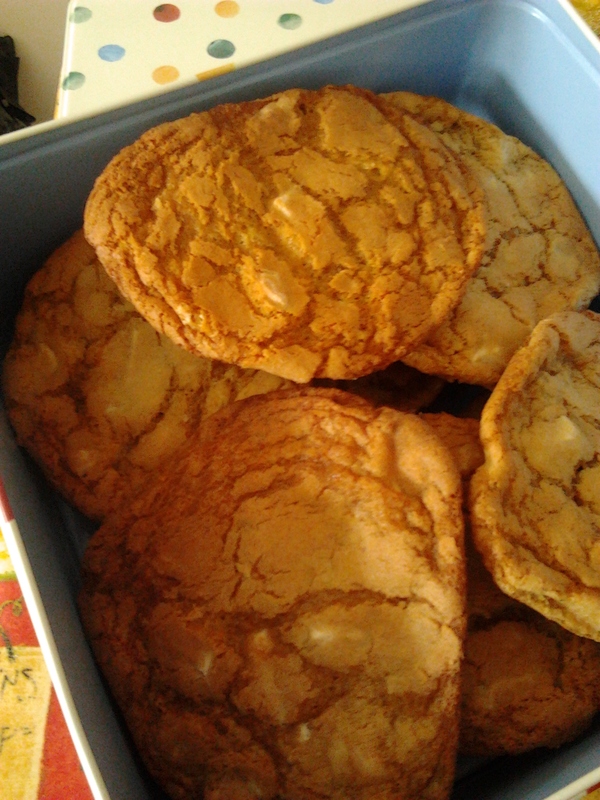 Lorraine’s cookies must be as big as your head! I could (only just) fit 6 on a baking sheet or roasting tray. The recipe says leave the cookies to cool for 5 minutes on the baking tray and then transfer to a cooling rack. I got distracted and left a couple on the tray, and they stuck. So do as you’re told! They were very well received and I’ll certainly be making them again. Probably every week.